Do you have spent a ton of money buying and many hours reading personal finance books? Do the works Robert Kiyosaki, David Bach, Suze Orman, Thomas Stanley and others line your library? Do you read every personal finance column you can lay your hands on and spend endless hours on-line visiting personal finance websites? CLICK HERE TO WATCH VIDEO. Do you find it strange that, in spite of the newly acquired knowledge, your financial circumstances do not seem to be improving, in fact you are more frustrated than ever because the theories are proving difficult to implement? What is the problem? In this article we find out why most personal finance books don’t help, and what you can do about it. At the end of the article, I have something juicy for you! 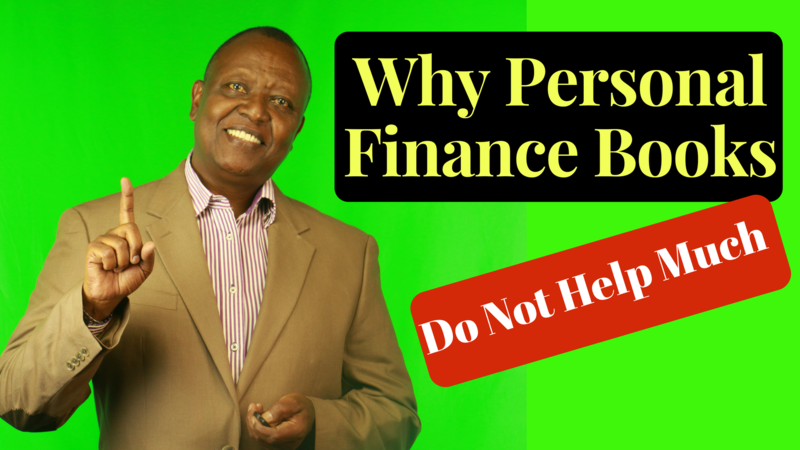 The first obstacle that confronts most Kenyan readers of personal finance books is that most are written for a totally different financial, legal, tax and cultural environment. Most of the books in the market are written for the American market and many of the strategies recommended may not work in the same way because of those differences. An example is retirement schemes. In Kenya there are three kinds of registered retirement schemes; occupational schemes which are employer based, National Social Security Fund (NSSF) and individual retirement plans managed by private fund managers. Each has a set maximum contribution and the individual has no say in how the contributions are to be invested. CLICK HERE TO WATCH VIDEO. In the US, retirement schemes are numerous; 401(K) plans, 403(B) plans, IRA (Individual Retirement Account), Roth IRA, SEP-IRA, SIMPLE IRA, Keogh and Social Security just to name a few. Each has complicated conditions which are usually described in detail in these personal finance books and recommendations made on how to maximize their utility including how to decide on where your contributions should be invested. Unfortunately, none of these recommendations are relevant to the local situation and all they serve is to further confuse already befuddled readers. With regard to investments, the books discuss a vastly more sophisticated environment. The American financial market consists of well over ten thousand individual stocks and almost as many mutual funds, US government bonds, Municipal bonds, corporate bonds, utility bonds, junk bonds not to mention derivatives. Our situation is much simpler with less than seventy individual stocks and a unit trust market served by only a handful of companies. Once again the advice from the books is of little practical help. The situation is exactly the same when one looks at the legal environment, taxation regimen and most emphatically, the social circumstances. Personal financial management theory is deceptively simple at first glance but in order to make it work in practice needs some background knowledge that is beyond the material presented in most personal finance books targeted at the consumer market. Indeed, these same gurus who write these books spend several years studying thick tomes for their professional examinations. Expecting to learn all they know from reading one of their consumer oriented books is ambitious at best. Most readers of these books find that they have acquired a wide range of knowledge but with little depth and still have to rely on the vendors of the products or services for guidance. This is so because the necessarily brief nature of the narrative in these books cannot articulate the fine nuances about the products and services needed to make independent and informed decisions. When one relies on the advice of the seller of a product or service to make a buying decision, one that has a major impact on the quality of their life, there is always a real danger of being misguided and taken advantage of. To complicate things even more is the cultural context. There is a yawning cultural abyss between the market for which these books are written and the local market; our extended family set up, our different (or absent) saving culture, concept of retirement etc. All these make the approach to even the application of even simple ideas like using a personal budget tricky. That having been said, some personal finance books are really helpful in the sense that they may inspire you to take charge of your financial future and also teach you the basic personal financial management principles. In fact many people’s lives have improved dramatically as a result of such inspiration. However, to make the most of them, you need to engage a financial planner or coach, one who is not employed to sell products and who does not earn commissions from any financial products you buy. That is the only way you can ensure you get objective guidance. Retaining a personal finance coach involves a substantial financial cost and if you are not yet ready for that, you can begin your journey by reading a book written by a Kenyan professional or enroll for an online video course to learn what you need to do to succeed financially. My book “How to become a Lifelong Financial Success” contains all the help every Kenyan needs with managing their finances. Professor Njuguna Ndungu, former Governor of Central Bank of Kenya says in the foreword to the book “This book is timely and very handy to individuals in appreciating the need for and realization of financial goals”. I am making a one special limited time offer; The book goes for Sh 1,950 but you can get it for the next two weeks at a discounted price of Sh 950 only (Your discount voucher number is List 2018). Please follow the link to get “How to Become a Lifelong Financial Success” to take advantage of this exclusive offer now!